Control. A person who is trained and tested on the route and safety rules so in an emergency they can deal with it. Basically the DFT and Southern want this person removed and replaced by a clippie. The RMT isn’t having it. And that’s where we are. Unless you can get the DFT to change its stance it’s deadlock. DOO is a emotive issue and those of us outside the Railways don’t know enough to be sure one way or another. Many trains run have run this way safely since 1982 through our stations (Thameslink) but it seems common sense to have safety precautions which the second person would be. However it is clear and you seem to agree, that the Department for Transport and the RMT need to sit down and come to a conclusion as meantime we all suffer. That is what we are asking them to do. Well said. Enough of the excuses and finger pointing. I wholeheartedly agree with every word, every sentiment. Enough is enough. I want my train service back. I was on a (delayed) train last night. A passenger didn’t get off the train in time. The guard rung the bell to ask the driver to stop as the train had already started moving. He then let the passenger off….45 minutes later the train is still sat there because the guard can’t close the doors again. Eventually the (obviously angry) driver managed to close the doors for him. Is this the critical guard training that you are referring to? Pretty ironic, although very annoying! Oh how utterly ridiculous. Not to mention very embarrassing! I don’t know the details of the problem you had on your train, but without the guard that person would have missed their stop. Common sense tells me there must have been some sort of problem with the doors and it isn’t going to take a driver 45 minutes to go and see what the problem is so – with respect – I think you have half a story there. I fully understand that the passengers must feel extremely frustrated, angry and totally fed up. I’m a guard in the Midlands and this is coming to us too. I don’t represent the RMT here although I am a member, but understand what is happening and am happy to explain. My mind the unions were sloppy allowing this at the time but that’s past. Despite the claims, DOO isn’t safer. In the 10 platform/train interface serious accidents that the Rail Accident Investigation Branch (RAIB) investigated over the last few years, 8 were DOO trains! 30% of trains are DOO and yet 80% of serious injury accidents were DOO trains. Safe?! The DFT have basically started to implement the recommendations of the McNulty report which was that DOO should be default for ALL train services across the UK. This should be a big concern for everyone. This isn’t about jobs for current employees, as we are all being told we have a job in the new role at the same pay. However, many services converted to DOO have ended up running with no extra staff member on board, and this is an additional serious worry for all. Not only is the guard being downgraded to a clippie, but often they aren’t even present at all, is this what you guys want? Thank you for your time and if you will allow me I will be happy to try and answer the questions you have from a guards perspective. How is it about jobs? They are guaranteeing our jobs! I will agree I have concerns about jobs in future though – if like my kids to be able to follow me into the industry. Ask most women how they feel about travelling alone on a train with no guard? Ask what happens if there is a fatality and the driver is traumatised, are you all going to sit tight until help eventually arrives? If there is an abusive drunk on board who is going to control that? Don’t kid yourselves fare rises will be any lower. If there are long term savings they will go to the shareholders. So you are agreeing that it IS about jobs? Not now, but in future, as in other industries, it becomes more cost effective to automate services and employ less people. I apologise that I’m not willing to pay extra money to guarantee a job for your children! I’ve seen countless people faint on trains because of over crowding. Guards can’t get through the train to help because it’s so busy. Passengers help each other and get on with it. As for train guards controlling drunks, I’ve seen a lot of unruly drunks on trains and never seen any intervention from a guard. Simply put a guards jobs is often done better by passengers. Before claiming to protect passengers, Southern staff should think about asking us what’s most important to passengers. I’m not a Southern guard. Im just talking about myself and when it comes to up here I will have a mind to the future, yes. I won’t apologise for that. However, that’s just my opinion. As I say, I work in the Midlands and yes we do go out there and are proactive in helping passengers. Sorry if that’s not the case down there. Get out of your head what you are paying will change. Has anyone promised you cheaper fares? This is all about future savings and higher profits. Higher profits mean more interest in applicants for franchises – at present there is low interest and that’s a serious concern for the government. They prefer at least three bidders, latest franchises have just two. You are obviously set in your opinion, that’s your perogative. Independent surveys have shown a very large percentage of passengers value the role of the guard. It’s not 100% though, and you are one of the minority that doesn’t Gary. Just to add up here I’ve been involved in helping vulnerable passengers most days be it concerned lone females, elderly passengers needing help, etc but more to the point have been involved in many safety incidents where my training has been invaluable. 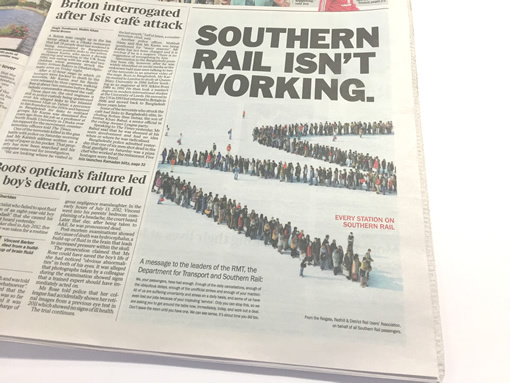 Whatever the rights and wrongs of DOO (which I agree with others is just a red herring) passengers are paying for something they aren’t getting – a train service that runs to the timetable set, let’s not forget, by Southern Rail. In my book that’s deception at worst, and theft at best – and all parties mentioned are responsible. Claire Perry needs to pull her head out of her ars*, stop counting the cash that Govia pays DFT and actually stop this mayhem by doing her job. TRAIN UNION RMT is offering a new approach in a bid to resolve the GTR dispute. It is a dispute about the proposed removal of conductors from trains and the implications that removing these safety critically trained staff would have. “I refer to the recent hearing at the Transport Select Committee where we were both asked: What could be done to help resolve the current impasse? You will also be aware that we will have both had numerous conversations with passengers and their Members of Parliament who are asking that we go the extra mile in seeking a resolution to the dispute. I would therefore wish to develop the offer of the new approach I made at the Transport Select Committee. The RMT will suspend calling any further industrial for the next three months if you will also suspend your proposals for a similar period. This will then allow us the time and space to sit down together and try and explore options that will seek to deliver the lasting improvements to service and reliability we all want. Survey of 1200 people by BBC Sussex. 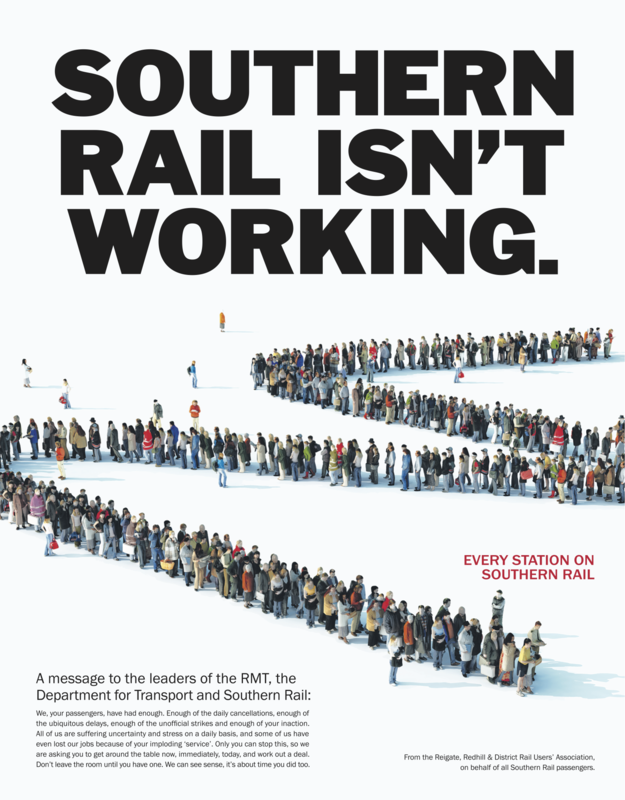 59% blame Southern Railway for the dispute, 9% the Government and 8% the RMT. 24% “other”. Given Southern Rail is attempting to compromise the safety of, and reduce the quality of service provided to commuters I am very surprised Reigate, Redhill and District Rail Users’ Association is taking Southern Rail’s side in this dispute.